The final season of Game of Thrones starts next weekend. NEXT WEEKEND! And because of that, winter is here — even though it is actually spring. I don’t know about you, but I want to be prepared. I’ve been re-watching Game of Thrones (one season left! 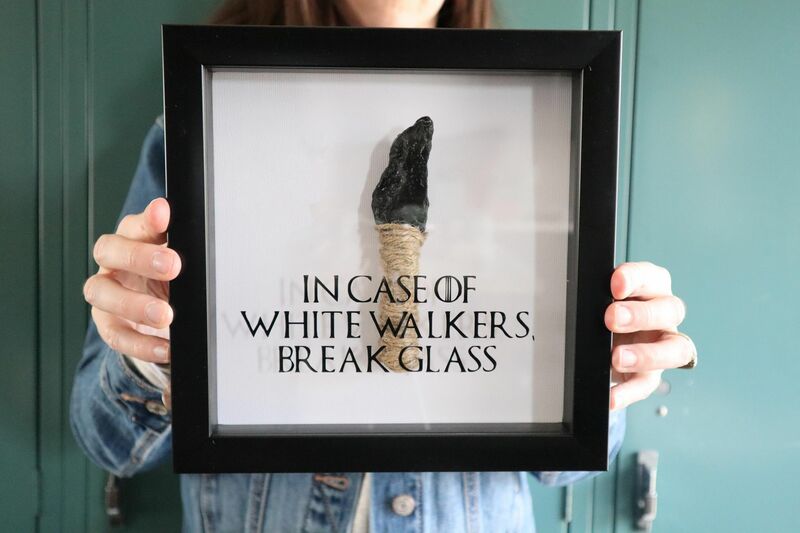 ), I’ve been training my own direwolf (and he’s adorable), I made friendly reminders to HOLD THE DOOR, and I’ve claimed the iron throne for myself (for under $25). 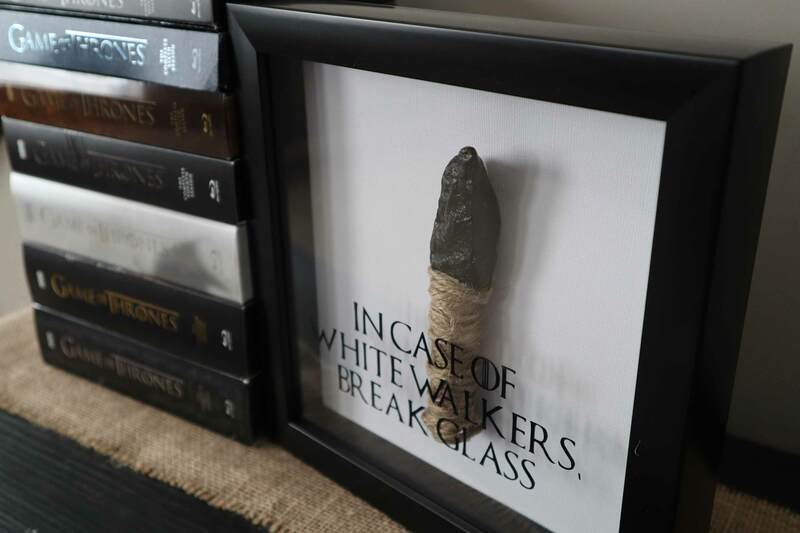 But we can’t forget about the white walkers, and that’s why today’s DIY will come in handy. To start, go rock hunting outside! I searched crafts stores at first, but really couldn’t find anything that resembled the shape of a piece of dragonglass. Then I realized I had “dragonglass” all over my neighborhood. Find an oblong rock, wash it, and let it air dry. Then paint it with black paint. For the shaft of my soon-to-be dragonglass dagger, I chose to use a clothespin since it was roughly the same size and length I was after. On the side of the clothespin with the gap between the pieces, add hot glue drops (a lot!) and then place one end of your painted rock between the pieces. Let dry and add more glue if your rock is not fully secure. Next, slowly add hot glue down the side of your clothespin and wrap your twine around the clothespin over the glue to secure it in place. Once your dragonglass dagger is complete, cut out an 8×8 inch square from a piece of white cardstock paper. Then using hot glue (the most important tool for this DIY! 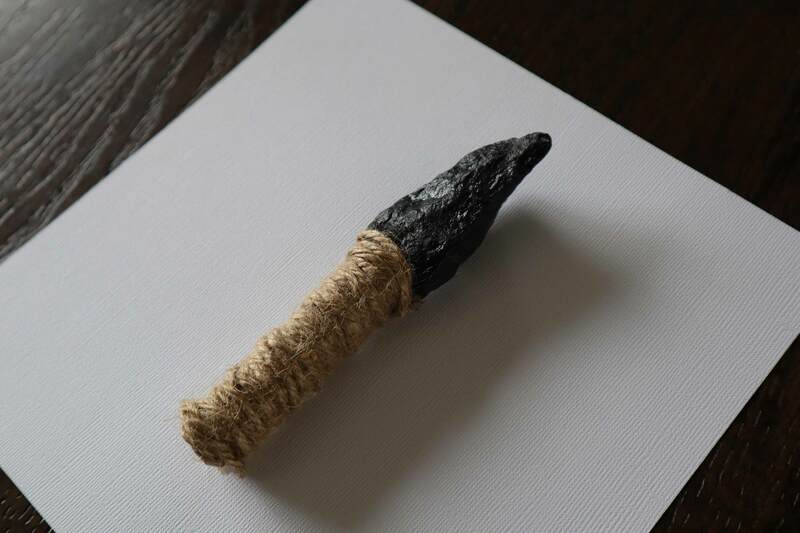 ), glue your dagger onto the center of your white paper square. See image below. Next, prepare your Cricut or other cutting machine. 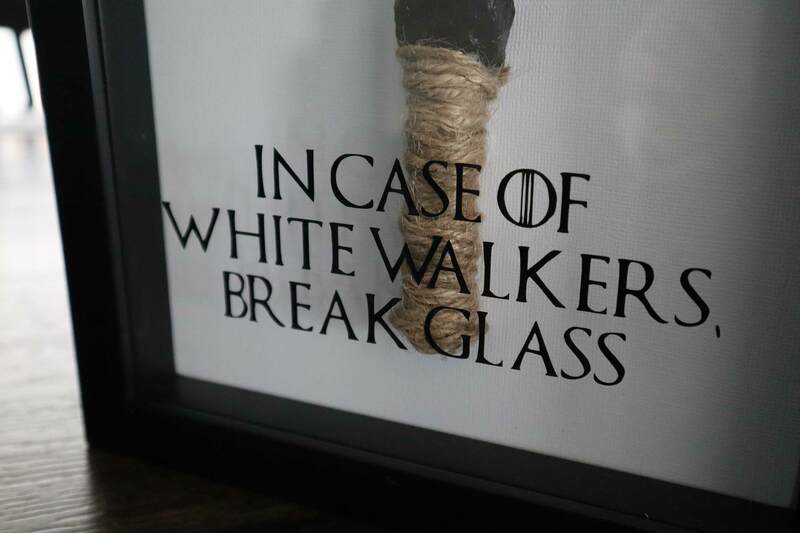 Download the “In Case of White Walkers, Break Glass” file (found in the list above) and load it into Cricut Design Space. For an 8×8 inch shadow box, size your file at 6 inches wide. 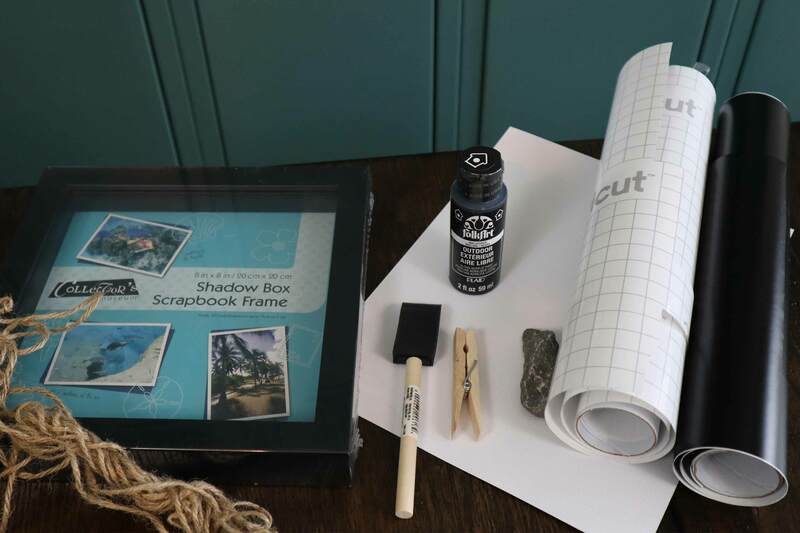 When preparing your cut, make sure to MIRROR your file, this will flip your file and allow for you to place the vinyl on the inside of your shadow box and still have the words facing the correct way! Once your vinyl is cut, carefully weed off the extra pieces. Then, using transfer tape, adhere your vinyl words to the shadowbox glass on the inside of the frame. I chose to place mine toward the bottom of the frame, allowing for good readibility since the colors behind it did not conflict with the color of the words. 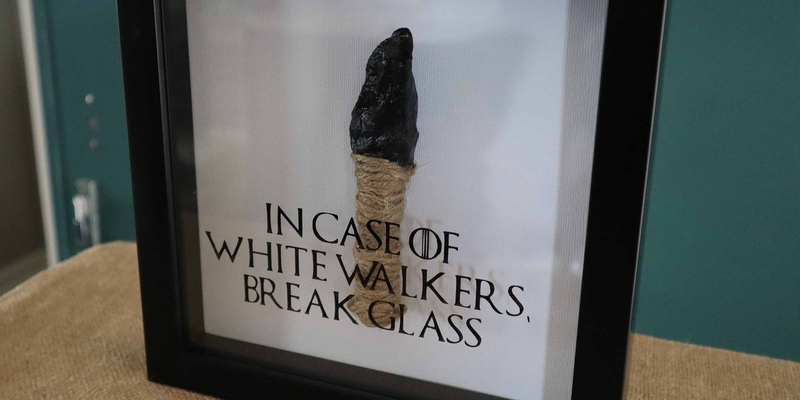 Place your glass back in the frame (if you removed it when placing your words on it), then add your white paper with your dagger to the frame, followed by the frame backing. 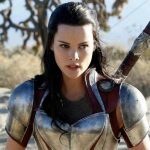 Previous Post Did These 12 MCU Characters Survive the Snap? What a clever idea and so effective too! This is such a great idea. I love the original you found on Pinterest, but absolute adore how you’ve made it your own for home use. It reminds me of those ‘incase of zombies’ glass boxes with a little axe inside. I’ve always wanted one of those, but now I kind of want this more. 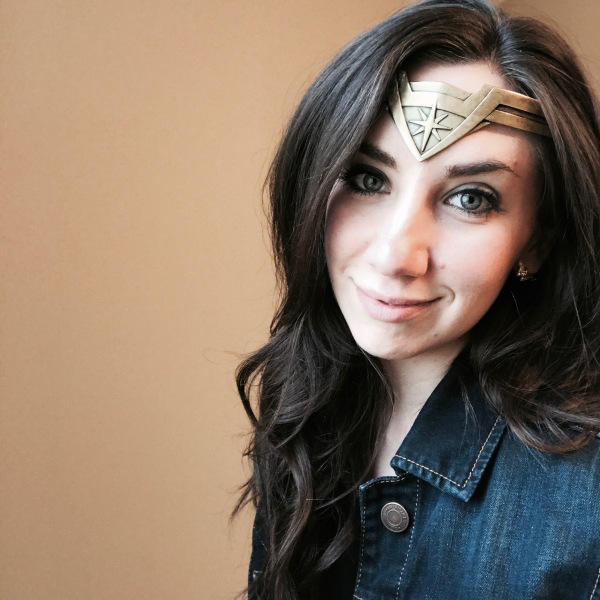 You should totally create an etsy store. I’d by the crap out of everything on there. 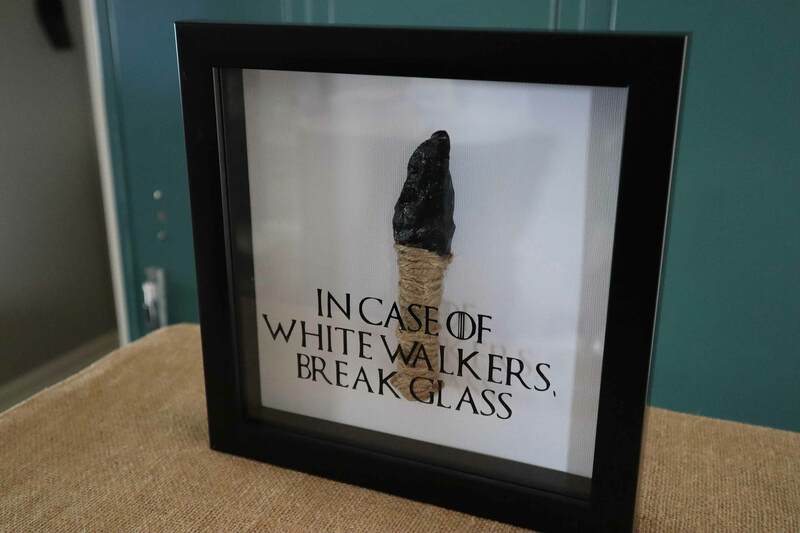 Even though I don’t watch Game of Thrones I think this looks really cool – and I’m going to send it to my brother because I know he’d totally get it! 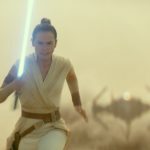 I am so looking forward to the newest season of Game of Thrones! I love this shadow box, it looks great! I am SO excited for Sunday. I’ve been counting down for months. 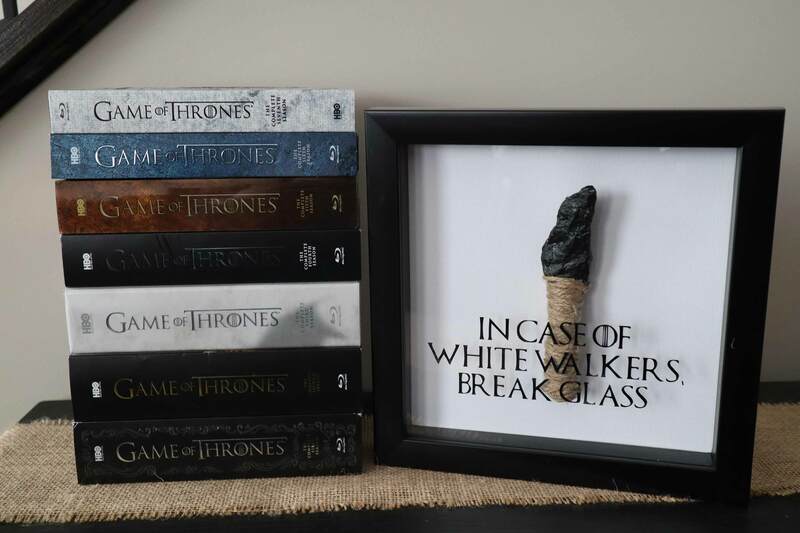 This is such a cute idea and perfect for GOT premiere party.